I’m so glad I get the opportunity to speak this afternoon before I head out on my mission this week. 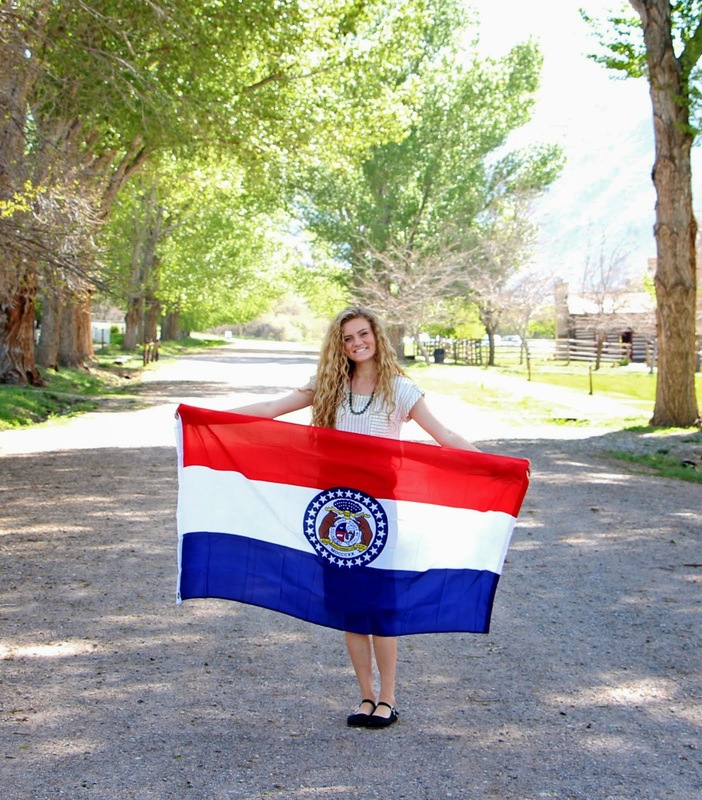 I have been called to the Missouri Independence Mission and will be serving in the Independence Visitors’ Center. I am so so excited for my mission. It amazes me how Heavenly Father is in the details of all of our lives. Since getting my call, I have really come to know that that is true. After my freshman year in high school, I went on a church history trip with 50 other youth for three weeks back east. It was at those church history sites and visitors’ centers where I really got my testimony of the gospel and of Joseph Smith. It was there that I felt the spirit so strongly for the first time testifying to me that this gospel is true. When I opened my call to find out I would get to serve in, what to me, is one of the most sacred spots, I was beyond thrilled. All of the church history sites have a special spirit about them. It is almost impossible to not feel at peace and want to smile when there, so yeah, I am incredibly stoked about going out to the midwest. I’m excited to learn so much more about church history and about the gospel and about our Savior, Jesus Christ. My talk today is based off of the Seeing Others As They May Become conference talk given during Priesthood session in October of 2012. I want to take certain points from Thomas S. Monson’s talk and talk about how we all can apply them in our lives to be a better missionary, and more importantly a better disciple of Christ. “Have ye spiritually been born of God? Have ye received His image in your countenances? Have ye experienced this mighty change in your heart?” (Alma 5:14). Just as a small changes happen to each and every one of us daily, we are also all capable of having big changes in our lives. I had an experience these last couple weeks in which the Lord really showed me the importance of seeing others as they may become as I wasn’t exactly doing that. I was getting ready to go on a trip in which I would be taking several plane flights by myself. And we all always here about the “plane flight missionary experience” that seemingly everyone has. So, as I was getting ready to leave on my mission in a month, I figured it’d only be right to bring an extra book of mormon along with me and see what happens. I prayed about possibly being given the opportunity to share the gospel while I was out on my own on this trip. Although that was on my mind to prepare myself for my mission, what was on my mind even more as “mission prep” was just talking to people. In my mission prep class that I took last semester, I was told over and over that all we needed to do to be missionaries was open our mouth and get to know people and learn about their lives and in turn share a little bit about us. I’m typically the type of person who doesn’t talk to strangers that much in airports or other places just because it’s completely out of my comfort zone, kind of like giving this talk is. ha. But, I knew that I needed practice so I attempted this a few times on my trip, and. I just got on my final flight back to vegas, socially exhausted and kind of discouraged. This lady sat down next to me and was putting on her makeup for a good ten minutes and smelt like smoke, and in the back of my mind, I was totally thinking, well she isn’t going to want to hear about the gospel or want to talk to me or anything, so it’s a good thing i’m tired and i know how to sleep on planes. turns out, i was 100% wrong on what I thought of her. We started talking, I found out she was coming home from visiting family. She and her family of course happened to be from Missouri! I learned about her family and her struggles in life and also all the good food places in Missouri. I told her how I was leaving on a mission in a few weeks, and I how I just finished up a year of school at BYU. and so on. and wow. He knows each and every one of us and knows exactly what we are going through and how we are feeling. Something that I learned on the Church History Tour that has stuck with me was hearing that difference between a sympathizer and an empathizer. I can have sympathy for others going through hard times and I can try to help them and try to understand what they are going through, but I can’t empathize with everyone because I have not personally gone through everything others have. Christ, however, has. He is the perfect empathizer. I love the scripture in John that says, “I am the good shepherd, and know my sheep, and am known of mine.” Let us make sure that we come to know Christ and our Heavenly Father as much as we can in this life, He knows us so well wants all of His children to hear His full restored gospel in this lifetime. And if we earnestly pray about having missionary experiences in our everyday lives. we will have them. I was able to share the book of mormon I had been lugging around all week with this woman that I met on my flight back to vegas. i’m not sure what happened with her or how interested she really was but as she got up and left, she thanked me and told me how she switched her seat an hour before the flight and started to tear up a little and just said, i’m going through a really hard time right now, thank you for giving me this. President Monson brings up one word after telling these many stories of missionaries and ward members seeing others as they may become. That word is courage. I am grateful for all I have been given, even my hardships and trials. It is absolutely amazing how the Lord works. I can bear witness that this is true. I didn’t know half of the reasons to why I had the trials I had at that point in my life when I wrote that, but I knew some of the reasons. It’s incredible how the Lord continues to teach us and continues to show us what He wants us to be. Everybody has trials. It’s a necessary part of this life, but we need to try to look at all of our hardships and trials in a different perspective. Heavenly Father gives us all of our trials in order to build us up into the person He wants us to be. If we knew who we were supposed to be after this life or even in 30 years from now, in my opinion, I wouldn’t believe that I could become that person, but that’s who our Heavenly Father sees in us. When we sometimes feel like He is breaking down the small humble cottage we just finished becoming. He is really just making room for the palace that He knows we can become. This principle has been so eye opening to me these last couple years. I have been able to see all the things I have learned from the toughest times in my life and to see why I needed to go through those moments to be the person I am today. I am speechless and constantly in awe at how much our Savior loves and cares about me and about those around me. I have said this for the past couple years, but I love trials. Definitely not because I am strong enough to not let any trial and hardship bother me, but because I get to look forward to something better that the Lord is preparing me for. Sometimes, we don’t find out what that something is until years down the road, or perhaps not in this lifetime, but I know that the something better is there and it is so fun to see His plan for us unfold. I want to close by testifying to you that Christ is involved in every detail of our lives. He loves us more than we know how to love. and He wants us to return to live with Him. In order to do that, and to be more prepared to be reunited with Him, we must draw closer to Him while we’re on this earth. I testify that Joseph Smith did restore the full gospel on this earth almost two hundred years ago. A gospel that had been prophesied of being restored since the prophets of Abraham and Moses. I testify that when we live in a way that is in accordance to Christ’s teachings, we can draw closer to Him and we can truly be happier than we have ever been before. I know that if we live in this manner, we will be so grateful in the future for the way we chose to live our life. I also know that the Atonement is the greatest gift the Lord has given to us on this Earth and that we can be forgiven of our mistakes so easily because of His grace. He is there for us. and He wants to do anything He can to help us while on this Earth so that we can return to live with Him. He is our best friend, our brother, and most importantly, our Savior. I leave for the MTC in 20 days and that seems absolutely crazy to me. But, I seriously cannot wait to go. I've been thinking and dreaming about this time of my life for years now and I'm so excited that I'm finally getting to live it. The past week, I've really been studying the Book of Mormon in more depth than I have done in the past and it has been the coolest thing ever for me. Our Heavenly Father has a beautiful plan for all of us and for His Earth. Everything from the time of Adam and Eve to the prophet Abraham in Old Testament times to Joseph Smith restoring the full gospel to now has ALL been a part of His plan. That fascinates me so much and I love learning more about the little details of His plan by reading and studying the Book of Mormon and by comparing its chapters to chapters in the Bible. I am so grateful for having the knowledge that I have gained by reading the Book of Mormon and studying it and the Bible. It has blessed my life immensely. It has made me so so happy and has given me a perspective on life full of hope and optimism.